Schäffer presents the world's first yard loader with lithium-ion technology. Two electric motors with high-voltage technology are responsible for the working hydraulics and the drive. The customer can choose between two charging systems and two battery packs. The innovative new loader benefits from the numerous advantages of a lithium-ion system and promises significant savings in maintenance and operating costs compared to diesel models and other battery concepts. The new electric yard loader 23e from Schäffer delivers emission-free operation: exhaust gases and noise are now a thing of the past. This is a significant advantage in sectors such as the indoor livestock business, where animals, humans and the environment benefit from this. Customers can choose between two lithium-ion battery packs. With the standard battery system, the loader is well equipped for most farm work. With the help of the power battery system, the operating time of the charger doubles to several hours. The power battery system can be retrofitted at any time. The two charging systems promise additional flexibility: Schäffer offers an on-board charger as standard, which is operated with a standard 230 V power supply. Add an optional 400 V external charger for even faster charging - the power battery system is charged up to 80 % in just 30 minutes. This means enough energy for the entire working day with a quick charge, for example during a lunch break. The battery can be charged at any time without affecting the lifetime - another advantage of lithium-ion technology. Speaking of battery lifetime, Schäffer guarantees a running time of 5,000 charging processes or 5 years of operation, whichever comes first. Friedhelm Brede, head of development at Schäffer, is convinced that the advantages of the lithium-ion battery are particularly apparent here. “Thanks to the pioneering technology, we can guarantee this extraordinarily long battery life. In addition, lithium-ion batteries are absolutely maintenance-free, there is no danger of lead or sulphuric acid and the 23e works reliably even at low temperatures," explains Friedhelm Brede. 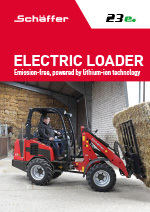 The use of an electric loader with lithium-ion technology brings significant savings. “The 23e's maintenance requirements are significantly lower than those of the diesel model. Much higher efficiency and significantly lower energy costs per hour of operation result in additional savings potential. The 23e is likely to be of particular interest and benefit to those generating electrical energy in the form of a biogas or photovoltaic system," Friedhelm Brede concludes. The 23e is the only battery charged loader available on the market that reaches a speed of 20 km/h. The drive motor is flanged directly to the rear axle and thus ensures direct torque transmission. The loader also brings all the other advantages that distinguish the proven loaders of the 23 series from Schäffer, such as the maintenance-free articulated joint and the original Schäffer axles, which guarantee high thrust as standard.